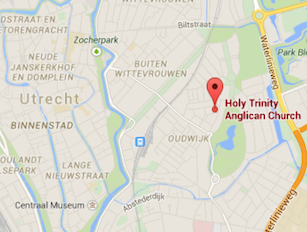 Our Associate Chaplain, Sam Van Leer, was licensed to Holy Trinity Utrecht in October 2011 to serve Groningen. Though American, Sam has, to date, served his entire ordained ministry in the Diocese in Europe. 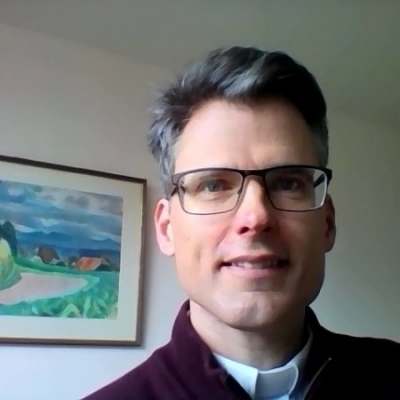 He was Chaplain to the East Netherlands Group (Arnhem-Nijmegen and Twente) from 2005 to 2011, and an Assistant Curate at St Ursula’s Bern, in Switzerland, before that (2002-2005). A native of Atlanta, Georgia, Sam was born and raised in the southern US, and was baptized and confirmed in the Episcopal Church. Doctoral research in Political Science brought him to Europe in the early 1990s, but he then followed a call to train for ordained ministry in the Church of England. Still, his interest in the study of the interface between power, democratic politics, and Christian ethics remains. He trained for ordination at Cranmer Hall, St John’s College, Durham University, England. In addition to working alongside fellow Christians to build up a new Anglican church community in Groningen, Sam is currently the Anglican representative to the Netherlands’ National Council of Churches, Secretary to the Anglican Church in the Netherlands, and an Assistant Director of Ordinands for the Diocese in Europe.